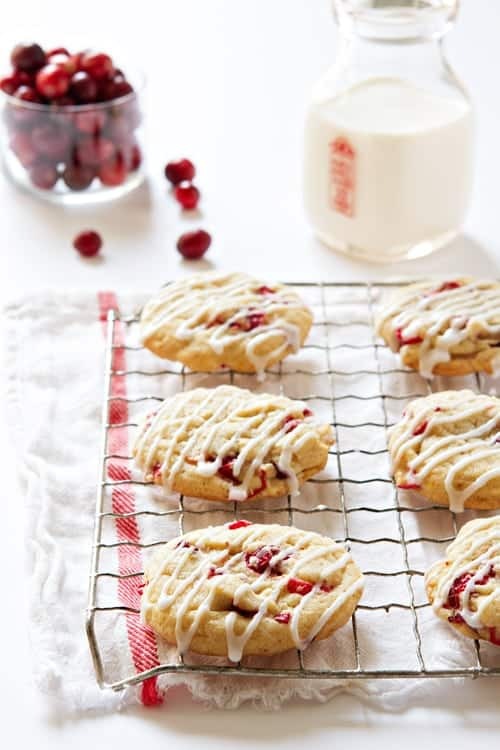 Orange cranberry cookies are a sweet and tart addition to your Christmas cookie tray. They’ll have everyone asking for more! Guys, Christmas is just a couple of weeks away which means two things; 1. I’m ready to get my holiday cookie baking on and 2. I better get my Christmas shopping list in check. Have you started your holiday shopping yet? Although I’ve definitely gone shopping on Black Friday, it’s so not my thing. I pretty much loathe crowds, long lines and waking up at ridiculous o’clock to get a $5 fuzzy blanket from Kohls. Because if I’m being honest, that’s pretty much all I’ve ever purchased – well, aside from a cheeseburger for breakfast at Bob Evans. Did you know you can totally do that? I prefer to shop from my couch, in my pajamas. No pressure, lines, or crowds – although I must admit, I kinda missed that fuzzy blanket and gooey breakfast burger. This year is Elle’s first Christmas and we couldn’t be more excited. She absolutely loves to shred paper, (Santa’s bringing lots of board books) so we think she’ll be a natural at gift unwrapping. Although I’m definitely not into shopping with the masses, I am into baking cookies and lots of them. 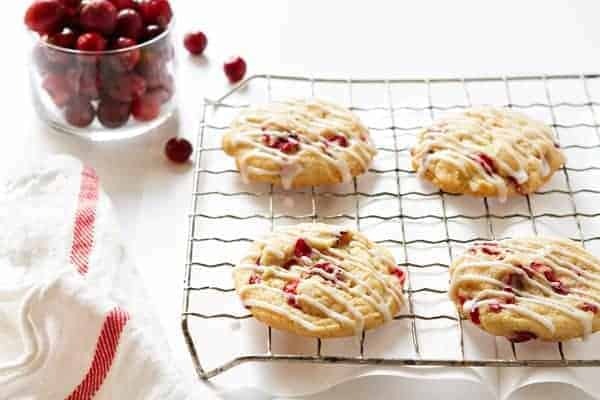 And first up on my must-make cookie list is this glazed orange cranberry cookies recipe made with loads of orange zest and fresh cranberries. And if you’re at all like me, you might just have a few bags of cranberries stashed in your freezer. I am a big fan of the sweet and tart combination of orange and fresh cranberries. From cranberry orange scones to homemade cranberry sauce with Grand Marnier (yes, I totally went there), I’m craving this vibrant duo all winter long. And let me tell ya, these cookies are no exception. They’re the perfect addition to your holiday spread and I’m 100% certain Santa will be filling your stocking with extra goodies if you leave him a plate of these on Christmas Eve. Are you ready to get your holiday baking on? Be sure to check out these pumpkin white chocolate chip cookies and these pumpkin spice toffee cookies on Food Fanatic from yours truly. I totally agree, Anna! Thanks for stopping by! Me too, Ilona! Tehy’re so great with a morning cup of coffee too! Gorgeous cookies, Jamie! Love the lighting! Makes me want to jump thru the screen and grab a one (or 3)! PINNED! Thanks so much, Betsy – I really appreciate you stopping by and pinning the recipe! They were so delicious! Thanks so much for stopping by! I haven’t started my holiday shopping yet and it hasn’t quite set in yet. Yikes! I feel like I should be panicking lol. The cookies look delicious! Can’t wait to try them. When do you add the flour??? I’m so going to make these! Do you think they would freeze well? I definitely think the dough will freeze really well. I hope this helps. Coach shopping is the best! These flavors are so festive! Yum! Yum Yum…..melts my heart away instantly. Made these today!! They are delicious! My new favorite cookie. I’m so glad the recipe worked out well for you. Thanks for dropping by. Can I use dried cranberries? It is hard to get fresh ones over at my place. If yes, do. I need to change the recipe? You could use dried cranberries, but it will yield a slightly different texture. I hope this helps. I made these today and the flavours were amazing!! One question though.. Are they suppose to be soft and cake like and not like a super crispy cookie? Hi, Sheryl! They’re not a super crispy cookie, but I suppose you could bake them longer for that consistency. I’m glad you liked them! Hi, Jeannette! I think frozen cranberries would probably work. Let me know if you have any more questions! Just made this for a cookie exchange tomorrow and they are so good! So happy I saw this recipe! I know it’s going to be a hit! Wonderful, Patricia! I’m so glad you like them!